This is a guest post by Glen Allsopp of PluginID. I remember back about 7 years ago when I was taking music lessons at school, there was a poster on the wall that really grabbed my attention. To be fair, it wasn’t difficult for a random object to attract your gaze as our Scottish teacher at the time didn’t have much in the way of keeping you interested. The poster outlined the different ways that we remember things and how different activities increase our chances of remembering something over others. After doing some research, I found that the contents of that poster were based upon the work of Edgar Dale back in 1969. Dale looked at the most effective ways of learning by teaching people similar material in different ways and noted the ability to recall the information after the teaching was finished. Today, many of you may know this as the Cone of Learning, but beware: although the cone is in fact based upon the results of Dale’s research, the percentage figures were never actually cited by Dale, and added by others after the initial investigation. Even though the Cone of Learning that became widespread contains erroneous figures, it does represent a guideline for the most effective learning techniques that the human brain is able to acquire and store information from. 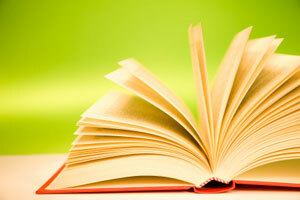 The least effective way to learn something is to listen to a lecture on the topic or read information about it. The most effective way to learn something is to teach others and use it in our own lives. The Cone of Learning suggests why you are more likely to remember parts of a movie than you are from a book on the same topic. A film uses audio and visual aspects that the brain is more likely to store and hold available for recollection (memory). After we discard the erroneous percentage figures, we still must take the cone as just a guideline — one which is subject to change depending on the learning style of the student or the studied subject. Different aspects such as what you want to remember and how often you put it into use will greatly impact how well you remember something. That being said, other things equals, the cone is a great guideline to follow to better imprint something to memory. 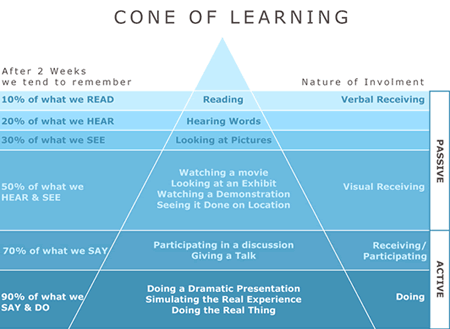 On that note, I thought it would be a good idea to look at the best ways to use the Cone of Learning concept, and apply it to an everyday example that we can relate to. The example I’m going to use in the following tips is looking at the best methods you could use to learn what yoga is and remember the necessary positions that are used. Give a Lecture. Although receiving a lecture is one of the worst ways to remember what you are being told, giving a lecture is one of the most effective. You could go into any college or university and offer to give a lecture on the topic of yoga and the many positions that are used. Write an Article. If you have a blog or a website you could spend time putting together an article on what yoga is all about and the movements that are often used in this meditative practice. Additionally, you could also create images to be used on the site to help explain the certain actions involved. Make a Video. Even if you don’t have your own blog or website, there are plenty of video portals such as Youtube and Metacafe that will allow you to upload your own videos for free. This will be effective as you can teach in the lecture format but know that you are instructing to a potentially worldwide audience. Discuss with Your Friends. One of the easiest teaching options that you have available to you are the members of your social circle. Wherever appropriate, bring up a topic you would like to discuss and share your wealth of knowledge on it. The more people you can discuss it with the better your ability will be to remember it in the future. Additionally, there are literally hundreds of ways you can discuss it online using the likes of online forums, twitter or even niche social networks. Do it Yourself. It’s no use trying your best to teach others about Yoga if it’s something you aren’t interested in and don’t do yourself. If you teach people the importance of controlling their breathing, then when you are performing Yoga in your own time… make sure you are controlling your breathing. Whatever you would teach others, you need to make sure you are implementing yourself. There are certainly more ways that you could look into teaching others and applying things into your own life. From holding classes in your house to simply creating an audio file of you speaking, see how you can apply teaching about your subject to learn more about a topic. As with most things in life, this isn’t going to apply to every single person, every single time. For example, from my research into this, it is claimed that autistic people are much more likely to learn from visual images rather than trying to teach someone else or do it themselves. Also, I know many people who have a strong preference for auditory learning over visual, for instance. Additionally, as stated, the figures in the cone are to be used as a guideline, some people will have a high success rate at learning through teaching others while for some it may not be as successful. Generally, look at the ones which are deemed to be the most effective and try the ones which work best for you. So, what are you going to do to improve your learning now? Glen Allsopp writes in order to inspire, awaken and motivate people into being who they want to be and living the life they want to live. 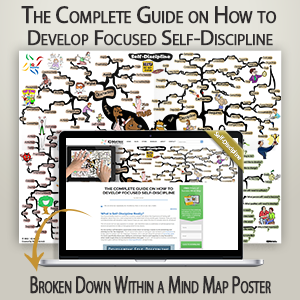 You can learn more about him at his Personal Development blog.